Manager David Cook had the full squad at his disposal for the visit to Whinney Hill on Saturday afternoon, with Bailey, Devenney, Lincoln, Walsh and Smith all back in the fold. 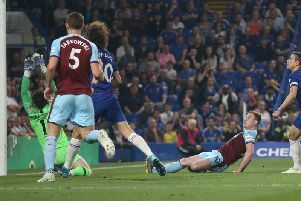 And it showed as Rimington were a different proposition to the depleted outfit that turned out at Burnley United, hitting the home side for six. With the intermittent snow flurries and a gusting wind, both sets of players were to be tested in the wintery conditions. Whinney Hill started on the front foot and pushed and probed Rimington’s backline, but were unable to muster a goalscoring opportunity, with captain McCarthy superbly marshalling his defence. The best chance of an entertaining opening 15 minutes came when Bailey exchanged passes with Bagot to get into the area. From a tight angle, he clipped his shot on the run wide of the upright. On 28 minutes, Langford’s inswinging corner found Lincoln unmarked at the back post, and he bundled the ball over the line. Rimington came again with a cross from Langford from the left flank which brought a header from Bagot, but it was difficult to add power and it was comfortable for the keeper to claim. As half-time approached, a McCarthy header from a Devenney corner crashed off the crossbar, before Lincoln stabbed in for his second of the game. Cook’s side were ruthless after the break, scoring four goals in a 20-minute period. On came Kiss for injured Langford, and with his first touch, Kiss worked space in the box and coolly finished. The next goal looked imminent, and it arrived on 52 minutes, as Bagot scored from close range, tapping home a Hill cross. On the hour Bagot capitalised on a defensive error, and he squared the ball to strike partner Hill, who rounded the keeper and slotted into the empty net. Rimington’s sixth and final goal came on 71 minutes as Cook fed the ball into the path of Bailey, and he kept his cool to bag his first goal for the club with the cutest of touches, which took the ball past the keeper and into the net. Whinney Hill pulled one back on 75 minutes as the busy striker latched on to a throughball before finishing first time past an outstretched Scriven. Rimington return to action on Saturday with a trip to face Burnley Belvedere, kick-off 2-15 p.m.